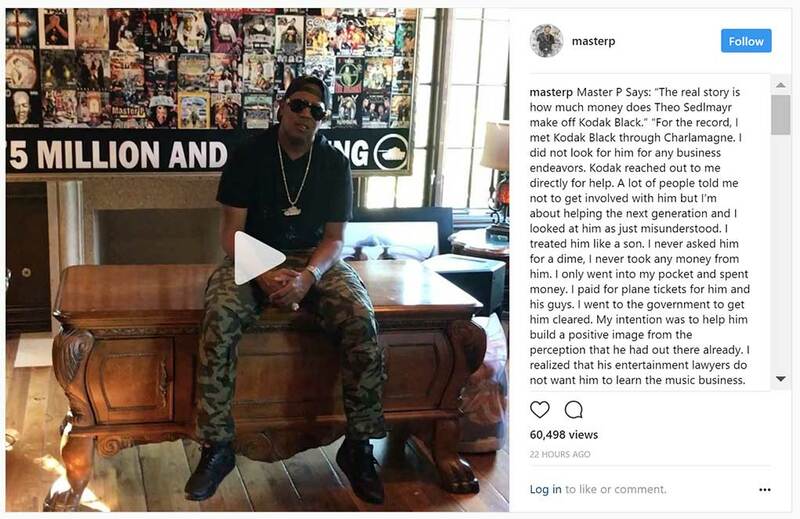 Master P is setting the record straight after Florida rapper Kodak Black accused him of trying to charge for mentoring by the one-time music mogul…. “The real story is how much money does Theo Sedlmayr make off Kodak Black.” “For the record, I met Kodak Black through Charlamagne. I did not look for him for any business endeavors. Kodak reached out to me directly for help. A lot of people told me not to get involved with him but I’m about helping the next generation and I looked at him as just misunderstood. I treated him like a son. I never asked him for a dime, I never took any money from him. I only went into my pocket and spent money. I paid for plane tickets for him and his guys. I went to the government to get him cleared. My intention was to help him build a positive image from the perception that he had out there already. I realized that his entertainment lawyers do not want him to learn the music business. They would rather keep him ignorant so that they can keep taking advantage of him. And they especially don’t want someone like me to be around him because they know I’m gonna keep it 100. Kodak asked me to manage him. And the first thing I told him was to get all of his contracts so that we could audit them, that’s just Business 101. Kodak asked me to call his entertainment lawyer, Theo Seldmayr, but he did not return my phone call for over 30 days and he never sent any paperwork, which is a red flag. Kodak doesn’t even know how much he’s actually paying this guy. And I told Kodak I could no longer do business for you, I’m not making any money off of this anyway. It’s just a headache. After this experience, I’m not doing any more free headaches, I’m not doing anything else for free. So moving forward, anybody that reaches out to me for business, it’s gonna cost. I have no more time to waste. I’m a businessman, people are going to pay me for my time just like any other professional. I don’t mind helping my people and giving back because that’s what I love to do. But if anybody on social media throwing up money and they are committed to helping their community, they should also pay for it out of their pocket if that is what they genuinely want to do. I am not God, I realize that I can only help people that truly want to be helped. Previous articleWas 50 Cent Behind Leak of Starz Power Episodes? Next articleBlac Chyna’s Mother Drags Cancer Survivor! P spilled some righteous tea!!! It seems to me he tried to give him some knowledge frm a business perspective nd he took it the wrong way. Once he asked P to manage him, of course tht man is going to make sure his paperwork is in order. It thn becomes a business arrangement.